NEFSC Science and Research Director Jon Hare is stepping into the blogging business for a while. He’ll be updating readers as we restart our research year in the run-up to our 2019 field season. Go, Jon! Starting our new year in February has been an adventure for the NEFSC. Stakeholders from across the region have been in touch with me and others on our staff asking about our plans for the rest of the year. Almost everyone has heard about “the machinery of government” and I have had a chance recently to see the upside of it: the ability of our staff to quickly assess priorities and get on with delivering quality science to marine researchers, resource managers, and business operators. This blog is generally used to highlight field work. Since I don’t do too much of that anymore (the downside of the director’s chair!) I have decided to use the blog to give updates on the status of projects that our stakeholders have asked about the most in recent weeks. I will be writing more of these as we gear up for spring and summer. Our spring bottom trawl survey aboard the NOAA Ship Henry B. Bigelow is set to leave Newport, RI March 9. That’s a few days later than first planned, but we are also extending the cruise by a few days. We plan to complete a full survey. This fieldwork is always influenced by weather, as well as vessel and equipment performance, so our staff is trained to make adjustments while still obtaining the best possible data. Our Canadian colleagues are leaving this week for their regular bottom trawl survey which, as usual, includes some stations in U.S. waters of the Gulf of Maine. The NEFSC research vessel Gloria Michelle is on track to complete the annual spring trawl survey of Massachusetts state waters. This time of year is also key for our work to recover endangered North Atlantic right whales. In comparison with last year’s zero newborns, there’s good news from the calving grounds off the southeastern U.S.: 7 new right whale calves have been confirmed so far this year. 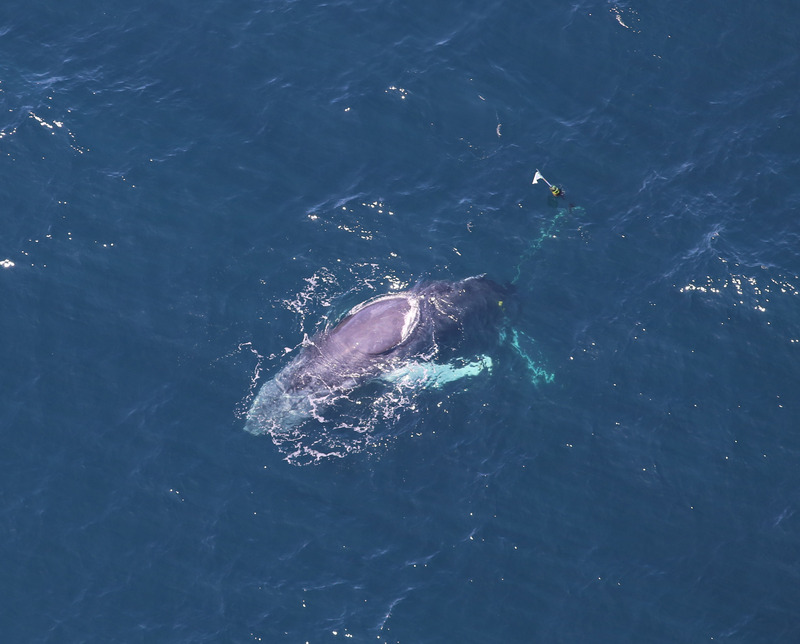 Our aerial surveys in the Northeast were also busy this winter with a large number of whales sighted south of Cape Cod. These sightings triggered short-term protection areas for these animals. We will be revising our stock assessment plans for the remainder of the year. We are working through timelines for biological sample and data processing, analyses, meetings, and other activities that underlie the many assessment products completed every year. We are in ongoing contact with fishery management partners in the region as we set priorities. That’s it for my first blog. Let me know what you want to hear about in my next one! 2017 has been a very low calving year for the North Atlantic right whale population. Only 3 calves were documented in the Southeast U.S. calving grounds – the lowest number on record since 2000, when only one calf was sighted. In the intervening years, calving numbers have fluctuated, but on the whole have been lower than right whale researchers would like to see for the recovery of such a critically endangered species. 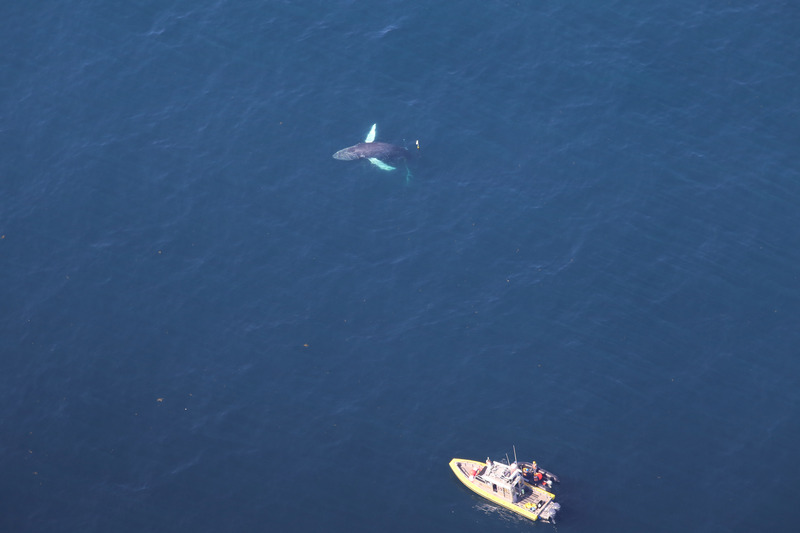 On April 12, both the Center for Coastal Studies and NEFSC aerial surveys documented a new mom & calf pair for the season, bringing the calf total for 2017 up to 4. While a sighting of new mom & calf pairs outside of the calving grounds is not unheard of, it is not common. So we were very excited Sunday (April 30) when we realized that we had found yet another new mom & calf pair for 2017! I tentatively identified the whale as catalog #1515 while still in the air, but researchers at the New England Aquarium, which houses and manages the North Atlantic right whale catalog, confirmed my identification on Monday morning. The new mom and calf were sighted feeding in the Great South Channel. #1515 has not been seen since 2009 (also with a calf), so she had been presumed dead by the New England Aquarium. She has been sighted infrequently since 1985 and usually only down on the Southeast U.S. calving grounds, so, much like our other recent mom/calf sighting of 1412, we do not know where she spends the majority of her time. Another mystery mom! Entangled humpback whale named Spinnaker sighted by the NEFSC aerial survey group May 14. A disentanglement team stands by. Heavy fishing gear is puling the whale down, with a yellow float visible to the right of the whale. Photo by Leah Crowe, NEFSC/NOAA taken under MMPA research permit # 17355. 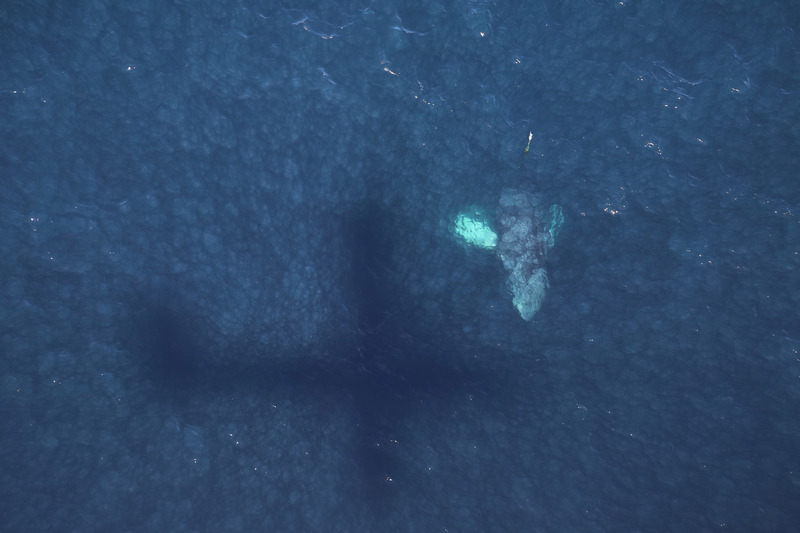 The shadow of the NOAA Twin Otter with the aerial survey team appears on the ocean surface next to Spinnaker. Photo by Leah Crowe, NEFSC/NOAA taken under MMPA research permit # 17355. Closer view of Spinnaker trailing fishing line and a float. Photo by Leah Crowe, NEFSC/NOAA taken under MMPA research permit # 17355. A second humpback whale, along with 7 fin whales, 8 sei whales, 3 minke whales, 5 harbor porpoise and 3 basking sharks were sighted, along with 4 North Atlantic right whales.